Curtainside advertising: Does it work? The success of truck and trailer advertising can be traced back to the 1920's, when box trucks plying the jammed streets of New York city began displaying large logos and ad messages to catch the eye of the passing public. It was quickly recognized as a viable alternative to both billboards and print advertising. For decades after, logos and ads on solid-wall trailers were hand-painted in a costly, labor-intensive process that had to be renewed often. Road grime, chips and dents took their toll, and artistic and advertising value faded fast. The advent of curtain side trailers provided a new format for trailer advertising just as large-scale silk screen and advanced digital printing techniques evolved to apply eye-catching graphics and vivid colors to the heavy-duty, 48-53foot long curtains. The result is an expansive 400-square foot ad space (per side) that easily rivals the visibility and high profile of a stationary billboard. 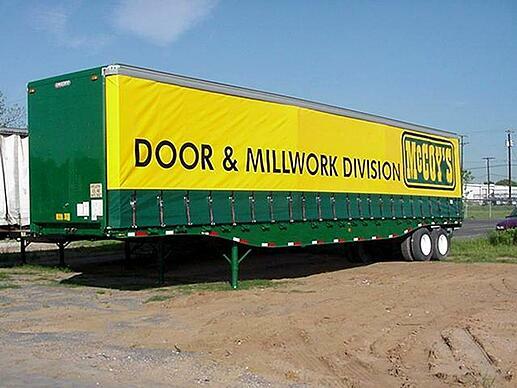 Think of a curtain side semi-trailer as a very large, blank canvas for artistically conveying vivid logos, advertisements or marketing messages. Applying logos and ads to conventional van trailers, conversely, comes with downsides. Pressure-sensitive “wraps” don’t adapt well to the ribbed, riveted surfaces of many solid-wall semi-trailers without costly surface prep and complicated application techniques. Vinyl sheet banner ads require permanent installation of large mounting frames around the perimeter of a solid-wall trailer to secure the sheet. A curtain side ad, conversely, can be created on a computer and printed on the curtain material designed and sized for the trailer, then installed without modifications or adding additional hardware. If/when the ad design or marketing message changes, new curtains readily replace the old ad. A moving curtain side ad has clear advantages over its nearest equivalent in both target audience and physical size: the stationary roadside billboard. A billboard tends to be mainly exposed to the same motorists who routinely take that route. As a result, the impact of the ad message diminishes with familiarity until, eventually, the billboard fades into the scenery and receives little notice. Research by the American Trucking Association (ATA) indicates that this is not the case with semi-trailer advertising like curtain sides. Because the truck is constantly on the move and often along changing routes, the percentage of unique “impressions” from motorists who haven’t previously glimpsed the ad is very high. One study of trailer ad exposure along the crowded freeways of Southern California estimated monthly impressions of 4 million per trailer. For a big rig on coast-to-coast routes along the interstates, the count of impressions is estimated to exceed one million per month. Other data from the ATA includes these revealing statistics. Fully 96% of motorists on the road surveyed noticed the ads on trailers. A similar number reported that the moving trailer advertisement was more noticeable than billboards along the same road. Finally, the recall rate—those who could later accurately remember the words and/or graphics seen on a trailer—was as high as 98%, far exceeding similar surveys of billboard impact. Recurrent cost factors also favor curtain side trailer advertising over billboards. Few advertisers who utilize roadside billboards actually own the billboard. Space on a billboard must be temporarily leased at ongoing monthly cost from owners who, in turn, have to pay for the land where the billboard is erected. The one-time expense of a creative logo or ad designed by a professional graphic artist, then digitally printed on a curtain sized to your trailer, is the most efficient and effective route to reach the widest market.